Culture Club took to the stage last night (October 21) to play their first gig in twelve years. 1. Culture Club are back! The eleven-piece band, including original line-up with Boy George on vocals, Mikey Craig on bass, Roy Hay on guitar/keyboards and Jon Moss on drums/percussion, performed songs from their new album Tribes as well as the old classics. 3. The audience loved it! The celebratory 'practice' gig lasted an hour and a half with fans leaving the venue ecstatic. 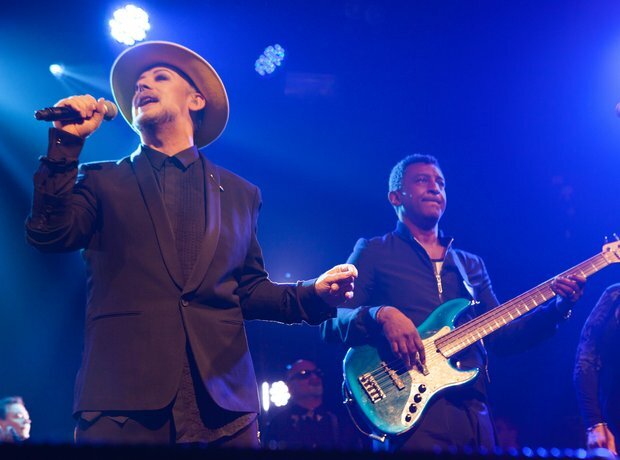 Writing on Twitter, Boy George thanked the band's fans for braving the aftermath of Hurricane Gonzalo: "Thanks to all of you who braved the autumn chill to see Culture Club at Heaven. Love you all! :)"
5. We're pleased to have them back!